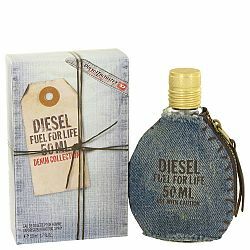 Diesel launched fuel for life denim in the summers of 2011. The signature flacon of the brand is dressed in denim to reflect the targeted youth. The fragrance embodies the spirit of freedom and rapidity. It is composed on the accord of citrus notes with woody effects and herbaceous spirit. The free-spirited and sensuous man in his youth would love to indulge in the perfume. The top note is a dive into a pool of crisp citruses. The heart is composed of fresh crushed raspberry and luscious lavender, while the woody base makes for the perfect balance.